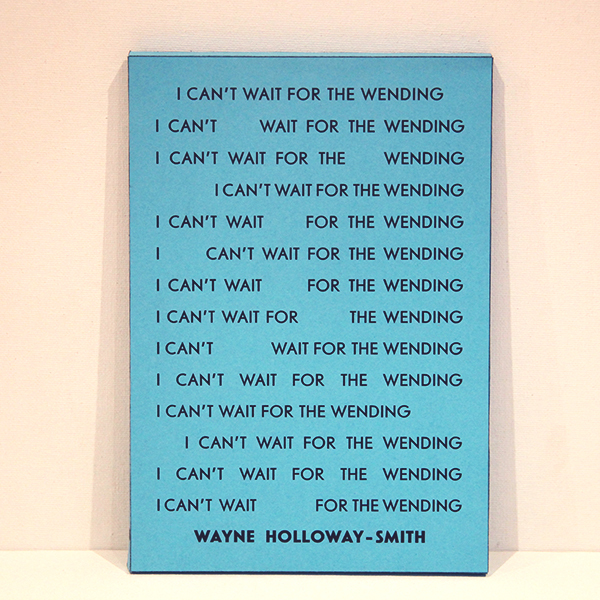 I CAN’T WAIT FOR THE WENDING (Test Centre) is a startingly imaginative non-linear collection of poems by Wayne Holloway-Smith. Published on unbound, unpaginated sheets in a box instead of a book, the page becomes a playground redrafting the boundaries of expectation. The curious title is taken from a misspelt line written by Holloway-Smith’s daughter, setting the tone perfectly for a sequence of poems that delight in creativity and chance. With loose sheets liberated from their traditional place of lock-up, the principal law presiding over this composition is coincidence. It would be remiss of a reviewer not to discuss structure, but this collection renders the task especially problematic. Each reader is summoned to shuffle their way through the custom-made envelope and its entrails in any order – a poem or two might well slip out along the way – and so we can never be certain to hold the artefact in its finished form, but that is precisely the point. ‘If you piled each of my bad thoughts on top of the next’ begins one of the poems near the top of my pile — a prelude, if you happen to read it early, to picking apart one of the oldest assumptions in literature, namely, the linear organisation of text. To read this sequence is to be cast adrift to a place of perpetual reinvention, as this ambitious project has neither beginning nor end, as though aiming to outsmart the governing absolute of time. The mischievous lack of punctuation says as much, since each poem embraces the fluidity of the free-floating form, with not a single comma or full-stop in sight. The most visually-exciting page in the pack is ‘Contents’, which, billed as a standard contents page, actually functions as a fascinating poem in its own right. The piece resembles a looping rollercoaster, with each segment comprised of a poem’s first sentence. Its shape recalls the calligrammatic work of Guillaume Apollinaire, who was famous for his experimental verse and avant-garde innovations. More than a century later, Holloway-Smith suggests there’s still reason to explore the depths of visual potential, foraging after formal inventions that challenge expectation. Outrageously inventive, the law of the line is broken from the offset. There’s a fascination with packaging in this collection, especially flat-packing, which translates into a subtle resistance to the reductive tendencies of modern life. ‘What / is / the / least / a / person / can / reduce / themselves / to’, asks the poet in ‘What’, devising a theory which is then challenged in ‘Elsewhere a man is unpacking himself’. Interrogating an era where entire lives can be slotted into a back pocket or reduced to a pixelated swipe, these behavioural patterns take on an especially fearful hue in ‘I’m sorry keep the obscene cat’. There’s a vivacious energy to Holloway-Smith’s imagery that gifts it the grandeur of poetry regardless of form. To take one of the most provocative examples, the speaker wakes ‘to the vibrating alarm of meat’ in ‘Hi’. This peculiar image mirrors a recurring motif that figures across several poems, one that explores the power dynamics between meat and the manipulation of its wrapper, or more specifically, between meat and the mouths for which it is wrapped. The ideas hark back to the criticism of human behaviour, which was similarly linked to packaging, but here with a more environmental bent. Beyond the excitement of formal experimentation, ecological catastrophe hazes up the horizon, albeit with the poet’s characteristically stripped-back tone. In ‘I’m Sorry’, for example, a throw-away comment on capitalism – ‘still there are always more mayonnaise jars at the supermarket’ – eventually culminates in ‘fear as big as a baby cow and growing’. It’s interesting to note how traditional black ink is replaced with a range of fourteen different colours, notably a range of sore reds and saignant blues. This not only materialises the playfulness motivating the project, but also subtly links to the environmental concerns of eating meat. This collection is no formal experiment for the sake of it — it’s an aptly-timed comment on contemporary society whose creatively articulated concerns ring loud and true. I CAN’T WAIT FOR THE WENDING demands a different mode of reading, one that encourages an open-minded approach to shifting poetic territories that slip free of habitual temporal constraints. Readers will emerge inspired and more imaginative from this magic box of poems. You can buy I CAN’T WAIT FOR THE WENDING from Test Centre. Boxes by Andrew Skudder. This image has been cropped and filtered. Licence.